As we already have told you, Bet365 offers the new customers a free bet bounus up to €200 and it goes pretty much like this : bet365 offers a 100% first deposit bonus to new players. For example: if you make a 50€ deposit, you get back the 50€ free from bet365, therefor you will have a total of €100 in your account, and so on. 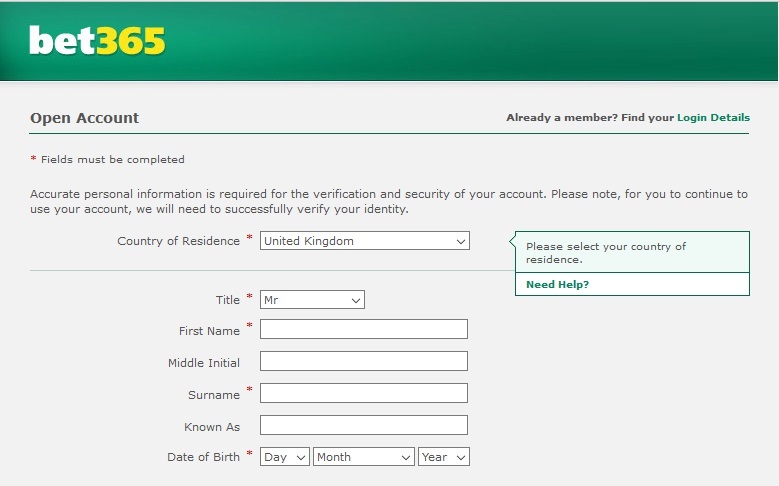 Here you`ll have to fill in all your personal details, preferences of language and others, you`ll have to choose an username and password and very important, don`t forget about the bonus code, that you have to enter at the bottom of the form, check for accepting the Terms and Conditions and here you are, almost there. The last thing you need to do is just click on the tab “Join Now”. After completing your registration, you will receive a confirmation email. That`s all! Now you can proceed with your new account and start by choosing the deposit/withdraw methods, then you can go on from there with you betting operations. Good luck!